I was talking recently to another SLP and of course we were exchanging ideas about how to get organized at the beginning of the year. So I thought I’d share my tried-and-true system with you. It has taken me several years to get to this point, and it will likely continue to evolve. Once upon a time, I put the folders into binders, but the binders grow too large throughout the year, and become more cumbersome. 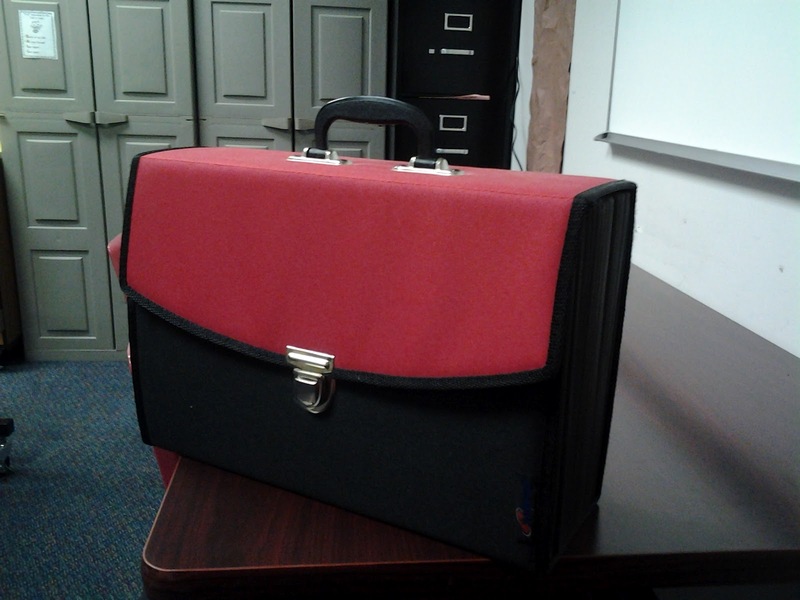 So I ditched the binder, and opted for an accordion file with a handle to keep them in. It is similar to this one from Walmart. They’re easy to grab and put back as I need them. I just put them in the order that I will see my groups, and voila! Ok, so what’s in the folders? 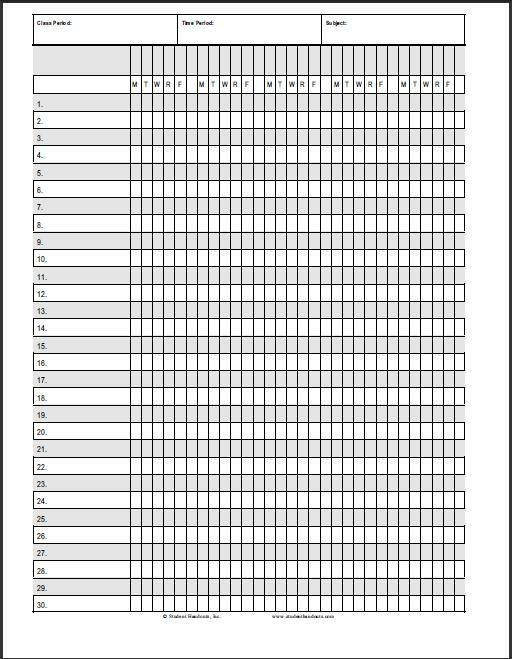 First, the front pocket: For each individual student, I have a data page. This includes the student’s name and date of birth, and 5 sections of notes. Each section is identical and includes: the objective targeted, room for data and notes, an indication of group or individual therapy, start/stop time for group, and selections for student or clinician absence/meetings/special activities (assemblies and field trips). I have come to love this system. I can easily know who I saw on what day and for how long with a code system I have developed. For each student, I denote G= group, I= individual, A= student absent, CA= clinician absent, CM= clinician in meeting, S=special activity (such as fire drill, field trip, or whatever). Most of my groups are the same duration, so I don’t denote that unless it’s different for some reason. So, I may denote “I” for individual therapy with my standard time frame, or “I45” to indicate individual therapy for 45 minutes. For clarification, I can refer back to the daily data sheets (from above). At the end of the day, I just zip down the list, and presto, I’m done wth attendance! From this attendance roster, I highlight students that I must bill Medicaid and can zip through my list pretty quick. And bonus, I can tell at a moment’s notice how long it is until I have the daunting task of quarterly IEP updates. I start those puppies two weeks out so I can chip away at them and finish in time. I try to use the same activity for most of my groups all day, although sometimes, depending on what I need to target, I may have something different up my sleeve for a few groups. Then, I just gather the other materials I may need, such as articulation or vocabulary cards, books or other visuals, or any manipulatives necessary. I keep all of that within an arm’s reach of where I sit in my room. This year, I share my office, and don’t have the luxury of my nice big assessment cabinet by my side like I did last year, so I’ll have to use some real estate on my desk. OK, that was a TON! Thanks for hanging in there till the end! If you have any questions, please comment below. Did I leave something out? Just ask! I’m also interested in your system. What do you do? Do you think it’s the best system ever? Let me know! I’m always looking for a way to make the day-to-day operations easier. This post originally appeared on Adaptable, Flexible, & Versatile Speech-Language Therapy. Karen Dickson, MA, CCC-SLP/L is in her fifth year as a Speech-Language Pathologist. Currently, she works for Valley View School District in Bolingbrook, Illinois. She provides speech-language services to students in pre-school through fifth grade. She has recently been inspired to start her own blog and invites you to visit her site at http://afvslp.blogspot.com. Love it! That might be a good idea for me, the concertine case, because I’m on the road a lot and work between a number of schools and ALWAYS forget somthing! Thanks for the excellent tips. I use a manila folder for each of my individual and group sessions. Inside the folder, stapled to the left side, is a data sheet for each student with personal info as well as their IEP goals. I also include an area to write “Needs” and “Worked On”…to keep track of who did what activities with me. I did use your attendance codes. They are working out great! Thanks so much! This is a great idea! As a hopeful SLP2B I’m constantly looking for organization ideas for when I actually become one. 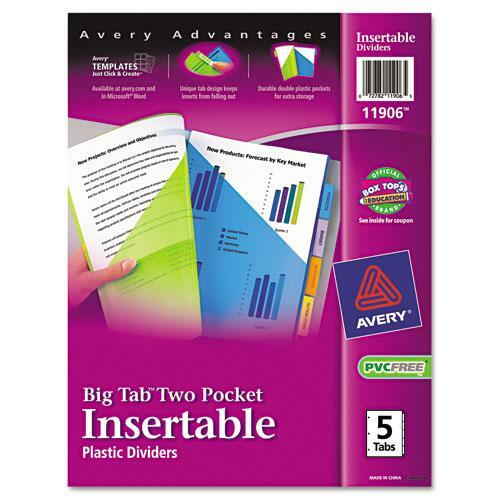 The idea of having a two pocket divider for each student is great… you can even organize it more by color for each school (for those that travel) or by age, disorder, etc. Great idea!